This Prestige 1 Ball Roller Black/Purple is one of a kind! It has a shoe compartment, accessory pocket, and room for one bowling ball. This bag has a 1-year warranty. The bag is really nice and it came within days was really surprised. Hello. This roller is about 27.8 pounds. Does the top bag come off? Hi. Unfortunately, the top bag does not come off. Can I get a pic of the inside. See where ball and shoes fit? Unfortunately, BSI has only provided us with the pictures as advertised online. What are the dimensions of this bag? The dimensions are 18 x 12 x 11. 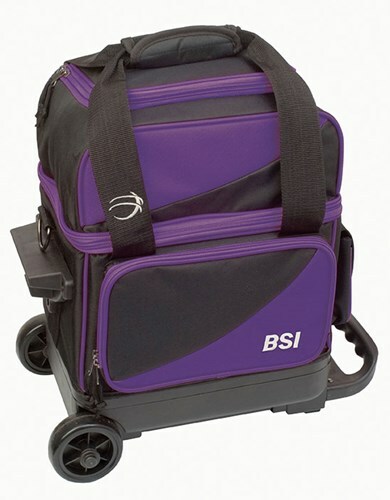 Due to the time it takes to produce the BSI Prestige 1 Ball Roller Black/Purple ball it will ship in immediately. We cannot ship this ball outside the United States.